Architect, academic and a best-selling novelist Lesley Lokko and Aleksey Muratov editor-in-chief Project Russia Magazine announced the winners of Archiprix International / the Hunter Douglas Award at the festive ceremony at the Central House of Artists in Moscow on May 24 2013. Of all submitted graduation projects an international jury straddling a broad range of design practices and design cultures nominated 25 for an award. Out of these nominees 7 winners were selected. Many of the 287 graduation projects show, as the jury called it, a kind of ‘new social consciousness’ in architecture. Most problems the world has to deal with are complex and are impossible for architects to solve. What the winning projects have in common, according to the jury, is that they give a simple yet effective answer through architecture to these complex problems. "This was perhaps the most classically architectonic of all the entries, a beautifully handled, spatially sensitive and environmentally-aware project in a spectacular setting overlooking a lake and it very quickly turned the jury conversation round to a real spatial discussion - plans, sections, sequence of spaces, materials, and so on - which was unusual in a day of more conceptual, social and political concerns." "This was one of those projects that works at all levels: from the first impression to the last. Imaginative, innovative, incredible graphics and a fresh, insightful and witty look at a very worthy and disturbing topic - outstanding." "This was a wonderfully refreshing contribution from China. Modest in its approach and representation, but executed with real depth and conviction, this proposal sought to balance old and new ways of living, pointing to a future template for multi-generational, modern, urban living spaces." "Beautifully depicted, deceptively simple and wonderfully poetic, this was one of those projects that you immediately want to visit - the jury were unanimous in their appreciation of the skilful weaving together of folklore, place and programme into a project that simultaneously celebrates the past whilst looking squarely into the future." "Perfectly sited, perfectly handled, perfectly executed, with some outstanding representations, this was a marvellous, evocative example of 'less is more'. The jury were pretty much unanimous in its assessment of this thoughtful, sensitive approach to landscape, memory and monument, both in terms of their relationship to visitors and their meaning to local inhabitants." "In similar territory, this modest but powerful project looked at the issues surrounding waste management and in the process, came up with an inventive, low-cost but high-impact system that literally jumped off the page. Another project that generated much discussion, it was great to see the underbelly of architecture tackled with such wit." "Another example of a student from a European context studying, working and analysing a 'developing nation' context, in this case, Ahmedabad. The drawings required intense concentration and study and revealed a smart, locally sensitive but forward-looking approach to the age-old question of how modernity and local tradition co-exist." Have a look at all nominated projects and the participants favourites. The MARKHI will receive and register the submitted projects after which the jury will review the projects in the MARKHI. The Moscow Architecture Institute MARHI is the most prestigious school for architecture in Russia. The Archiprix International workshops are coordinated by the Strelka institute. the Strelka Institute is a post-graduate institute dedicated to developing new perspectives on critical issues in contemporary Russia. The Archiprix International workshops will take place in the educational center of the GARAGE CENTER FOR CONTEMPORARY CULTURE, an independent platform for new thinking. Through an extensive program of exhibitions, research, education, and publishing, Garage reflects on current developments in Russian and international culture, creating opportunities for public dialogue and the production of new work and ideas. Central House of Artists is one of the most famous exhibition centers of Russia, an initiative of the International Association Confederation of Unions of Artists.GARAGE CENTER FOR CONTEMPORARY CULTURE is an independent platform for new thinking. Through an extensive program of exhibitions, research, education, and publishing, Garage reflects on current developments in Russian and international culture, creating opportunities for public dialogue and the production of new work and ideas. At ArchMoscow Next all submitted gratudation project (287 from 76 countries) will be on show, as well as the results of the workshops. This morning it was time to put the panels in place. Click here for photo's. Arch Moscow Next opens at the Central House of Artists on Wednesday and last until Sunday. What has happened in Russia is a reflection of the transition from a communist to a capitalist society. Where once the community was very important, the collective has now disappeared from all political, social and spatial processes. There is no longer a government that controls things. Developers and private individuals call the shots. This is especially disastrous for the quality of urban planning. Optimistic factors, according to Bart Goldhoorn, are the new possibilities for architectural education and a young generation of spatial professionals who are slowly but surely making a change in course. Text Indira van 't Klooster. Indira van 't Klooster: You came to Russia in 1993. What attracted you at the time? Bart Goldhoorn: What interested me was the question of what effect the transition from communism to capitalism would have on architecture and urbanism. What makes this question quite interesting is that you have here a system of governance that can change from one day to another, but the buildings remain. This means that, even with respect to planning, no change has taken place - a replacement of old with new regulations- but rather a superimposition of new rules on top of the old system. Recently, a new law was passed in which many old rules were abolished, but in practice these are still used. To affect change you must go to a judge, but who would do that if it is known that the judge is not autonomous? In Russia you can see how power, politics and capital are interconnected in very raw form, and that the rule of law with a separation of powers is a prerequisite for urban planning to function well. IvantK: What is the state of urban planning at the moment? BG: For the functioning of a society negotiating is necessary, but that is very difficult in Russia. There is simply no tradition. This applies not only to government or the private sector, but also to residents. As a result, urban planning is entangled with rules. Everyone stands their ground and nothing happens. Moscow has a huge traffic problem; the city is beyond congested. But new roads are not built, because all the vacant land is claimed, either by commercial parties, as potential building land, or because it is intended to become green areas. Moscow has 21 square metres of green space per inhabitant - much more than other global cities. But that green is protected. And behind it stands an army bureaucrats keeping watch over the green. IvantK: Are foreign examples also taken into account? only offer Western clichés. Then they declare, 'The car is passé, we should put more emphasis on public transport.' They say this in a country that has known nothing but public transport for 70 years, about a city that is completely congested while car use is less than half that of other European cities (and public transport use is double). But instead of responding, 'We're going to lay down a new road system outside the residential neighbourhoods like we did in the 1960s in Europe', it is proposed that public transport would solve the problem. Why? Because these roads should be directed through green areas, and green is ecology and therefore sacred. It is grist to the mill of the bureaucrats, who see green as their property. In short, Russia is very interesting because it offers a vastly different perspective on contemporary issues. IvantK: What should one do as a young architect in Russia? before you can get there, it takes a while. The instinct of clients is that an experienced architect can do better. In addition, a network is very important. Many architects learn the trade from father to son. This has everything to do with the hierarchically structured society. A small breakthrough is that Sergei Kuznetsov, former partner of SPEECH, recently became the Chief Architect of Moscow. Himself only 37 years old, Kuznetsov is not as enamoured with foreign contributions from architects, but simply wants to give young Russian architects a chance. Moreover, he realizes the importance of quality public space and urban planning. This ensures renewal. IvantK: In the field of architectural education, are significant developments underway with the arrival of the Strelka Institute (postdoc, research) and MARCH (an independent masters course)? practitioners such as Alexander Brodsky, Sergei Skuratov and Vladimir Plotkin. IvantK: How would you describe typical Russian architecture? BG: What is really special in Russia is that there is a strong classical current, something which has never ceased to exist. The Neoclassical architecture of the 18th century that we also know from the period of Stalin has continued to develop up to the present day, and some agencies can carry out that style really well. At its foundations is a firm belief in classicism. It is much more than a postmodern game of columns and shapes. A second approach seeks inspiration in the imperfect, the do-it-yourself architecture of the dacha, the marginal. Alexander Brodsky is its main representative. This style can be explained as a reaction to communism, wherein people do not want to be part of a social structure - whether it be communist or capitalist. IvantK: Does not today's international approach to new building also fit with that? metre is no exception in some areas. IvantK: It is noticeable that the tone of PROJECT RUSSIA is critical and business-like. Do you notice any effects from the all the topics it has put on the table? difficult, but it is possible to shape the younger generation. The jury meeting for the Archiprix/Hunter Douglas award 2013 took place in Moscow, Russia, in mid-October 2012. The jury members straddled a broad range of design practices and design cultures: from Canada came landscape architect Susan Herrington; from Norway, architect Kristin Jarmund. From Switzerland, Austrian-born architect Hubert Klumpner. From the United Kingdom, architect and academic Lesley Lokko, and from Russia came architect Yuri Grigoryan. After reviewing the 287 projects that participate in this Archiprix International edition, the jury members were asked to give some general remarks on the projects. Hubert Klumpner Hubert Klumpner is director of the Venezuela-based Urban Think Tank together with Alfredo Brillembourg, and is Professor of Architecture and Urban Design at the ETH Zurich.Ssince 2001 he has been urbanism consultant of the International Program for Social and Cultural Development in Latin America (OAE and UNESCO). Susan Harrington, Professor of Architecture and Landscape Architecture at the University of British Columbia in Vancouver, Canada where she teaches in the architecture, environmental design, and landscape architecture programs . She wrote articles on how designed landscapes reflect ideas regarding nature and culture and her book, Cornelia Hahn Oberlander: Making the Modern Landscape is forthcoming with the University of Virginia Press. Lesley Lokko, studied at the Bartlett School of Architecture and Planning, University of London. graduating in 1995 with a distinction in design and technical studies, before going on to gain her PhD in Architecture from the same institution in 2007. She is a founding member of ThirdSpace, a UK based collective that researches the relationship between architecture and globalisation, a course directorand co-founder of the MArch programme Architecture, Cultural Identity and Globalisation (MACIG) at Westminster University and is an active member of the UCT funded African Centre for Cities. Lokko is a highly appreciated speaker and guest teacher at schools all over the world, as well as being a best-selling novelist. Kristin Jarmund who has run her own practice Kjark since 1985. The practice´s design philosophy aims at solutions that reduce complex problems to simplicity in form and function, yet still allowing for a sensitive awareness to context and the human dimension. Jarmund designed many award-winning buildings. The practice's best known works are Justervesenet laboratory and office building, the kindergarten and school projects Stensby, Benterud, Gulskogen, Råholt and Gjerdrum, the Nydalen Metro Station in Oslo, and the Norwegian Embassy in Kathmandu, Nepal. Yuri Grigoryan is one of Russia's best-known architects and director of Project Meganom, an architecture office that is famous for such buildings as Barvikha Concert Hall and Tsvetnoy Central Market. Grigoryan is also director of the educational programme at Strelka. 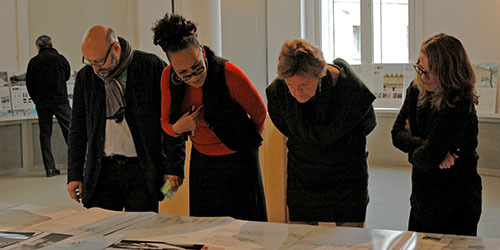 The registration deadline for the Archiprix International 2013 is closed, and at the MARHI in Moscow an inventory of submitted projects takes place. Some 300 graduation projects in the fields of architecture, urban design, and landscape architecture will participate in the Archiprix International 2013 Moscow edition. Almost all 300 projects are now online. The seventh edition of the Archiprix International takes place in May 2013 in Moscow (Russia). The event include an exhibition in the Central House of Artists, workshops at Strelka Institute that are open to the designers of the registered projects, and the presentation of the Hunter Douglas Awards. Universities worldwide were asked to nominate their best graduation project for the Archiprix International 2013. Some 300 applied. The designers had to send a presentation of their graduation project to the Moscow Architecture Institute MARHI, one of the co-organisers of the Archiprix International 2013 edition. The MARHI received parcels from all over the world: Portugal, Japan, Chile, Australia, USA, China, Uganda, Norway, Russia of course, and even Iraq. The entries range from very small and local to futuristic large-scale schemes, from ready-to-build to theoretical. All projects will be on show as part of the Arkh-Moscow, the biggest yearly architectural event in Russia held in the Central House of Artists. And they are likely candidates for one the Hunter Douglas Awards. Mid October an independent international jury will review all projects in Moscow. The jury members of the Archiprix International 2013 are: Yuri Grigorian (architect, Russia), Susan Herrington (landscape architect, USA) , Kristin Jarmund (architect, Norway), Hubert Klumpner (architect/urban designer, Venezuela) and Lesley Lokko (architect/novelist, South Africa). The nominations for the Hunter Douglas Awards are announced mid November. The announcement of the winners will take place during the award ceremony on 24 May in the Central House of Artists. Archiprix International is proud to announce the start of the seventh edition of the Hunter Douglas Awards for the world's best graduation projects in architecture, urban design and landscape architecture. The Archiprix International 2013 will take place in Moscow. We are honoured that the Central House of Artists, Strelka, and MARKHI are willing to be our co-organisers for the 2013 edition. After successful editions in 2001 in Rotterdam, 2003 in Istanbul, 2005 in Glasgow, 2007 in Shanghai, 2009 in Montevideo, and 2011 in Cambrigde (Mass.. USA), Archiprix International will again stage a unique presentation of the world's best graduation projects. Archiprix International 2013 will take place in May 2013 in Moscow. This edition will be hosted and co-organised by the Central House of Artists, Strelka, and MARKHI. The Moscow Architectural Institute, MARKHI, is the most prestigious school for architecture in Russia, with a tradition of 250 years. The Strelka Institute for media, architecture and design offers a free postgraduate programme. The dean is Rem Koolhaas. The Central House of Artists will be the exhibition venue during Arkh-Moscow, the biggest yearly architectural event in Russia. Over 1500 faculties from more than 100 countries are invited to take part. This makes Archiprix International by far the biggest competition for newly graduated architects, urban designers and landscape architects. No other competition for young talented designers displays such a broad insight in worldwide trends in education and the fields of architecture, urban design, and landscape architecture. The best projects, selected by an international jury, will receive the Hunter Douglas Awards at a special award ceremony. The awards carry the name of our partner Hunter Douglas, producer of well known brands like Luxaflex and Luxalon. The award ceremony is accompanied by a conference, a series of presentations of participating projects, and an exhibition. The designers of the best graduation projects can participate in an international design workshop the week before the award ceremony. Call for entries. Archiprix International invites all universities and colleges teaching architecture, urban design and landscape architecture to select their best graduation project and to ask the designer(s) to submit the selected project for participation. Designers who have graduated since 1 July 2010 are eligible to participate. The deadline for registration is August 1 2012. Projects can be submitted until 1 September 2012. All projects will be presented in an exhibition, on the website, and in a book containing a DVD. All the project designers will be invited to the workshops which will be held in May 2013 in Moscow. Participation is free of charge. The Archiprix website will display a web presentation of the projects submitted. This website also contains a presentation of the projects submitted for the 2001, 2003, 2005, 2007, 2009 and 20011 editions, and the world's largest database of universities and colleges teaching architecture, urban design and landscape architecture. Bart Goldhoorn introducing the three venues in Moscow (Russia) where the Archiprix International 2013 will take place: the Central House of Artists, Strelka, and MARKHI. What happens when the world’s best graduates in the fields of architecture, urban design and landscape architecture travel from all over the world to Moscow to design plans to free the city from its planning deadlock. What to do with the huge Military and secret service zones in the city, the surplus of unused green areas, abandoned railway yards or the huge fenced schoolyards? Moscow’s Holy Cows are not are not addressed in a way that the establishment had expected. This film documents the workshops organized by the Strelka in cooperation with Archiprix and shows the experiences of the Archiprix participants. By working together on the design tasks they learn to know each other as colleagues. During the workshops an international network evolves that is in line with the new way of working where designers operate internationally in varying partnerships.